Personalized and perfect to dress up your cakes and desserts. Make your names the star of the show during your cake cutting with these chic acrylic cake toppers from Weddingstar. When it comes to putting a personal touch on all the elements of your wedding day, a personalized cake topper is a must-have for couples who love modern design. 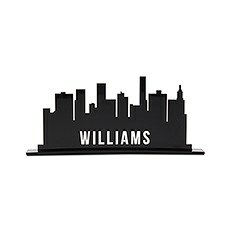 These unique cake toppers can be customized with your name to add an especially stylish look to your cake. 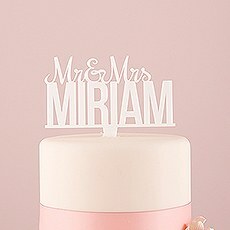 With several designs for our custom text wedding cake toppers, we make it easy to find one that suits your style. 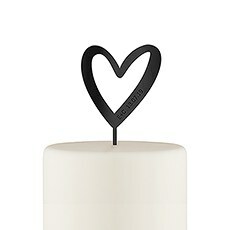 You can choose a sleek and sophisticated city skyline or a romantic and charming heart. 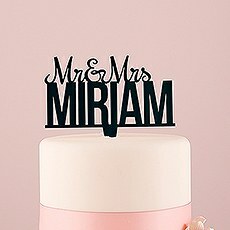 Or, simply make your names the star of the show with a "Mr. & Mrs." cake topper. No matter which one you choose, your guests will be delighted by this sweet and modern style.One of the biggest benefits of choosing from this collection of cake toppers is that every design is made with acrylic. This lightweight material rests easily on top of your cake by inserting a slim stake at the bottom. 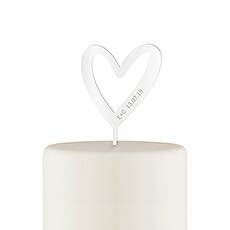 It won't sink down, topple over or damage other wedding cake decor in any way because it's so light. Despite being very strong, the acrylic can be cut into delicate designs, so you'll enjoy fancy flourishes and fine detailing on your cake topper. Acrylic also holds up well and is easy to clean, so you can hold on to your personalized wedding cake topper as a keepsake and reuse it for special occasions like anniversaries in the years to come.Make your wedding cake look spectacular and special for your wedding day with these acrylic cake toppers from Weddingstar. You'll find a great selection of customizable wedding decor when you shop on our site, including personalized wedding cocktail napkins, bridal party gifts and guest favors. Shop now to discover unique and stylish items for celebrating your wedding and other important events like engagement parties and bridal showers.